Medicine is often framed in terms of a dichotomy between science and humanism. On one hand, the practice of medicine is rooted in the unwavering principles of science that are applied in a rational and predictable manner. As a first year medical student, I often feel inundated with the teachings of this part of the dichotomy, which I like to think of as the what of medicine—what tests and procedures do I need to perform to diagnose and treat the disease? Less apparent in the first year curriculum is the human aspect of medicine, which testifies to the why question—why do we treat disease? For me, this query is more appropriately answered wearing the patient’s cap. Anyone who has had a broken leg or a horrible case of the flu knows why he or she needs medical treatment; spending eight weeks on crutches or being confined to bed with a debilitating case of nausea is simply not the way human beings are supposed to enjoy life. This ability to wear the patient’s cap, to understand and share the feelings of another, is more formally canonized in the doctrines of medicine as the quality of “empathy.” To empathize with another is to step out of one’s own shoes and to try to envision life in someone else’s. 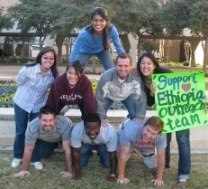 As I contemplate my upcoming experience in Africa, I find the ability to empathize with Ethiopians particularly challenging because the Ethiopian experience is so different from my own to the point that it seems impossible for me to emulate it in my mind’s eye. I have never been to Ethiopia (much less Africa), so what little I know about the Ethiopian culture and condition has been gleaned from the impersonal transactions between myself and the information that has appeared in books and presentations about the country. In the context of our medical trip, I have been confronted with sobering statistics about the abysmal state of health care in the country. As I ponder these statistics, I find them compelling, but I think I fail to appreciate fully their significance. As much as I try to empathize with the plight of Ethiopians, I have never felt that truly visceral reaction that I expect will come with the actual experience of living among the Ethiopian people and knowing first-hand what it means to live in one of the poorest nations in the world. I hope my experience abroad will allow me to feel truly for the suffering of those with conditions so difficult for me to imagine right now.